My problem at the dinner table is not getting my boys to eat their vegetables, but getting them to eat the entree. They eat the fruits and veggies first and I have a couple who struggle eating everything else. They want 2nds and 3rds of the fruits and veggies. Don’t get me wrong, I am not complaining. This is a good problem to have. I start having a problem when the entire bag of oranges disappear the day I buy them. 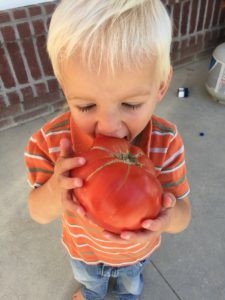 Here are a couple things we do that we feel are the reasons my boys loves fruits and vegetables! Don’t worry! They are simple! #1 – I buy fresh vegetables every week and break them up into pieces for an easy grab and go snack. Every week I buy a head of broccoli and cauliflower, carrots and celery. When I get home I wash them all and cut them all into bite size pieces and place them in Ziploc bags. 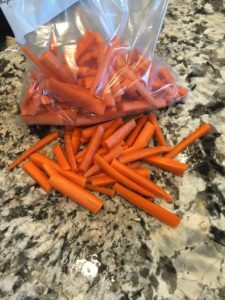 It is an easy grab and go snack for my boys! When they open the fridge, they see the bags and grab! The next great reason to do this is it makes your life easier as a mom!! This is perfect for an easy vegetable for dinner. Grab the bag for a last minute fresh veggie OR steam them OR throw them in a casserole dish you are making! Done and Done!! So fabulous! I find when I don’t break them up into bite sized pieces it doesn’t get eaten. It just sits in my fridge until it goes bad. NO BUENO!! Hint: Its cheaper to buy whole carrots than mini carrots. Just slice them up. #2- I put out fresh fruits and vegetables out on the counter on a plate. What happens if you put food out in front of people? THEY EAT IT!! When I put fruits and vegetables out on the table, it is gone fast. You want your kids to eat healthier? Put it out on the counter for them! I do this with sliced apples, pears and oranges too. I find when I cut up the apples we don’t go through them as fast. 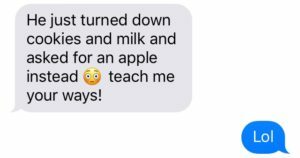 Instead of everyone eating a partially whole apple (Seriously I find half eaten apples all over my house) everyone gets as many slices as they want. Add a little lemon juice and it will keep them looking fresh! My boys let me know when we are out! That is their go to snack! #3- We introduce new foods and buy new fruits we are unfamiliar with. This is my husbands favorite thing to do! When we go somewhere, if there is a new fruit to be found he will find it!! We are known to always have different fruits and vegetables on our table. Next time you are at the store, buy an Jicama (ic-ah-mah). Squeeze some lime on top and add some chili pepper!! YUM YUM YUM!! Yes grazing for humans is such a thing! During the summer my boys live in the garden! When my husband comes home for lunch he asks where the boys are. I simply say, “Grazing!” I love looking out the window and seeing 5 little toe heads chowing down of fresh produce!! They are in the garden eating everything they can. This is the first year that I actually picked a red tomato off our tomato plants. Usually they are devoured! We planted a lot of tomato plants this year! For lunch and dinner, no matter what we are eating, I always add a vegetable or piece of fruit to their plate. The other day my son made lunch for his brothers and had their plates all ready! I loved seeing not only a ham and cheese sandwich, but carrots and broccoli on each plate as well! 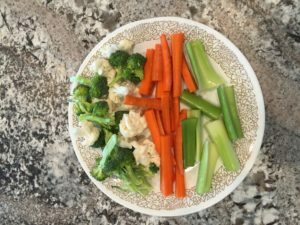 When I asked my husband why he thought our kids loved fruits and veggies so much, he responded simply with, “Because we do!” Your kids watch you and emulate everything you do! If you love fresh produce and make it a big deal to have it in your home, that message will be relayed to your kids! I love that my boys love fruits and vegetables! I love seeing their creations they make with fresh produce! I have seen cucumbers made into cups and apricot nectar poured in them!! Really! I have a picture to prove it!! 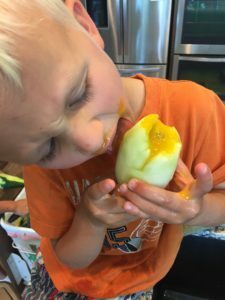 I hope these ideas help your kids love fruits and veggies like mine do!! ENJOY! !